Robin is passionate about both pets and people. She enjoys discovering animals’ unique personalities and building relationships with them as she cares for them. 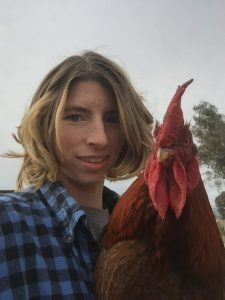 Besides typical pets like cats and dogs, Robin adores chickens and has owned many different breeds of them. Robin’s natural love for animals was evident as a child, and all her life friends and family have trusted Robin with caring for their pets. She has always had a way with animals. Robin finds diverse ways to help her community. As a previous farm owner, she and her family shared their abundance of produce and eggs with the local pantry and neighbors. They even fed seconds to livestock as to not waste anything. She raised goats and taught classes on how to make cheese from their milk! Robin is an ardent supporter of low-cost spay and neuter efforts and education. She worked for years with a spay-neuter-release program in her hometown to control the feral cat population. Many stray and unfriendly cats were relocated to work as barn cats and control rodents. While animals are definitely a big part of Robin’s life, she enjoys canning & cooking, classical music, and American history. Neil Tyson DeGrasse is her celebrity favorite. Her family of six love to go hiking and exploring rivers with their dogs. Robin covers our Meridian territory.